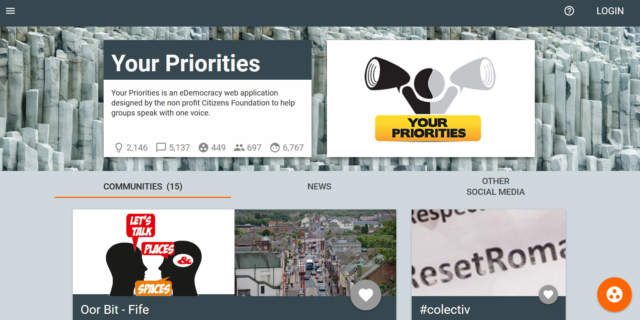 an eDemocracy web application designed to help citizens speak with one voice. Your Priorities platform in Reykjavik is offering a successful model experimenting with citizens in Iceland, integrating large-scale deliberation into democratic decisionmaking. The platform crowdsources opinions on city legislation, with the most popular ideas then being debated by the city council. The key element of the platform is a simple but powerful collective debate system. Each point can only be 500 characters and people can mark points as helpful or not helpful resulting in a list of the best points for and against. Both sides of the argument are equally represented in the user interface and this is highly effective in facilitating consensus and in the inclusion of minority arguments. The application has been used by the city of Reykjavík, Iceland.